Q: Why is Mugabe's picture included? He wasn't a dictator when Carter hosted him after his win in the 1980 election. 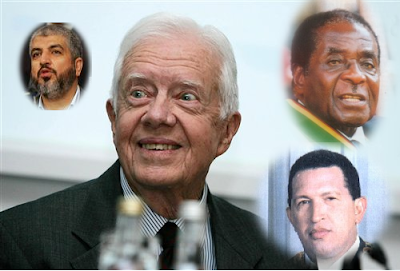 A: Carter's meddling in Zimbabwe goes back to the start of his administration. His Zimbabwe policy was a combination of disdain for the Ian Smith government and a willingness to turn a blind eye to the thuggish regimes in the area. This included ignoring Mugabe's campaign of terror leading up to and through the 1979 elections when Muzorewa became PM through majority vote. Because whites still held 28 percent of the parliamentary seats, African leaders refused to support the new government and Mugabe threatened more war. Carter, in a move that presages his career in and out of government ever since, sided with the anti-democratic African leaders and persuaded Congress to maintain sanctions on Zimbabwe. So, the new Zimbabwean government was isolated and left to fend off Mugabe's thugs alone. Ultimately, the Muzorewa government collapsed and new elections were scheduled for early 1980. Carter's meddling continued when he declared that, although the 1979 election was fair he could not support the outcome because Mugabe did not participate. That plus Mugabe's threat of continued violence if he did not win the election ultimately resulted in his coming to power. Carter, as he is wont to do, declared the 1980 election 'free and fair' and lifted sanctions. A little more than a year later, Mugabe initiated Zimbabwe's downward slide from democracy by suggesting a referendum be held to determine if the country should be a one-party state. So, in summary, Carter's meddling then and thereafter has earned him the company illustrated above. Trackposted to Rosemary's Thoughts, Big Dog's Weblog, third world county, Woman Honor Thyself, and The Yankee Sailor, thanks to Linkfest Haven Deluxe. "The U.S. is in recession as I define it," Buffett said at a news conference. "I would define that as a situation where people are doing less well than they were three months, six months or eight months earlier and most businesses find themselves in that position too. "If were are in a non-recession, I don't think people want to see it going in the same direction as it is and saying it's wonderful," Buffett added. That second paragraph appears to have been butchered by the Reuters editor, but, I think it was intended to convey the idea that recession is the consensus opinion on the street. I maintain that public opinion should not be used as evidence of recession. Why? Because, in man-on-the-street interviews, people tend to repeat what they hear on TV and read in the paper. And, both those outlets have lately been full of speculation about recession. So, better to stick with the technical definition of recession: Two consecutive quarters of negative growth for the GDP. After all, that is the objective gauge of what the man on the street really is thinking. Tag: Buffett economy Trackposted to Rosemary's Thoughts, Right Truth, Kodera's Korner, The Yankee Sailor, and DragonLady's World, thanks to Linkfest Haven Deluxe.